May 24, 2015 – On May 24, 1962, astronaut M. Scott Carpenter lifted off in a spacecraft atop the Mercury-Atlas 7 rocket and became the second American to orbit Earth. His spacecraft, which he dubbed Aurora 7, attained a maximum altitude (apogee) of 164 miles and an orbital velocity of 17,532 miles per hour. His primary goal during the mission was to determine whether an astronaut could work in space, a major stepping stone toward a lunar landing. Carpenter’s flight included numerous scientific experiments, including observations of Earth’s weather, land masses, horizon, sunrises and sunsets. He deployed a balloon to measure the drag of the balloon in the very thin atmosphere and observe its behavior, its distance from the capsule and the various colors it was painted. The balloon did not inflate properly, but Carpenter was able to judge that orange was the most visible, which NASA later used as a guideline to paint objects necessary for orbital rendezvous procedures. Carpenter’s Aurora 7 capsule circled the Earth three times during it’s 4-hour, 54-minute flight. The flight further qualified the Mercury spacecraft systems for manned orbital operations and provided evidence for progressing into missions of extended duration and consequently, more demanding system requirements. 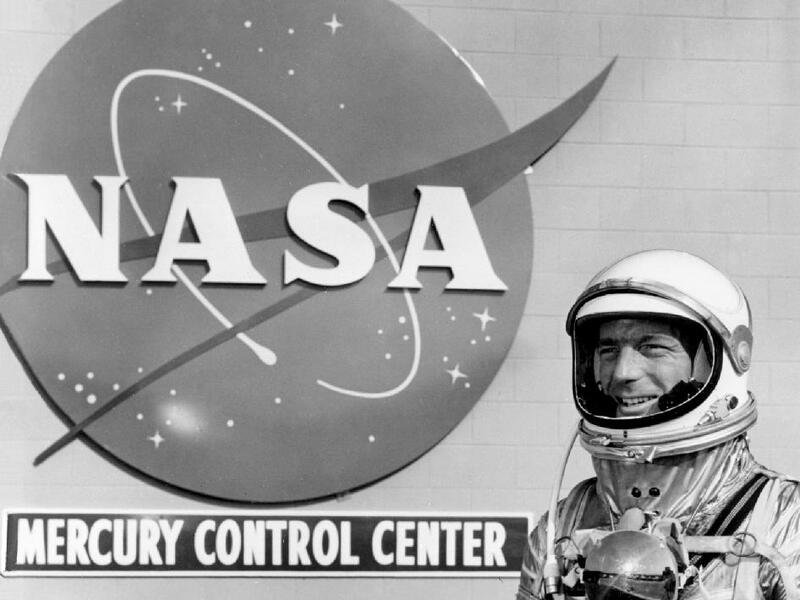 Malcolm Scott Carpenter was born in Boulder, Colorado, May 1, 1925. He attended primary and secondary school in Boulder, graduating from high school in 1943. After graduating from high school, Carpenter entered the Navy’s V-5 flight training program at the University of Colorado. The program was designed to give potential pilots advanced academic training at the same time they received basic experience in aircraft. After a year there, he spent six months in training at St. Mary’s Pre-flight School, Moraga, California, and four months in primary flight training at Ottumwa, Iowa. When the V-5 program ended at the close of World War II, Carpenter enter the University of Colorado. He earned a bachelor of science degree in aeronautical engineering from CU Boulder in 1949. Commissioned in the U.S. Navy in 1949, he was given flight training at Pensacola, Florida and Corpus Christi, Texas designated a Naval Aviator in April, 1951. During the Korean War, Carpenter served with patrol Squadron Six, flying antisubmarine, ship surveillance, aerial mining and ferret missions in the Yellow Sea, South China Sea and the Formosa Straits. He attended the Navy Test Pilot School at Patuxent River, Maryland, in 1954 and was subsequently assigned to the Electronics Test Division of the Naval Air Test Center, also at Patuxent. In that assignment, he flew tests in every type of naval aircraft, including multi- and single-engine jet and propeller-driven fighters, attack planes, patrol bombers, transports and seaplanes. From 1957 to 1959 Carpenter attended the Navy General Line School and the Navy Air Intelligence School and was then assigned as Air Intelligence Officer to the Aircraft Carrier, USS Hornet. Carpenter was selected as one of the original seven Mercury Astronauts on April 9, 2959 and specialized in spacecraft communication and navigation. He served as a backup pilot for John Glenn, the first American to orbit the Earth, in February 1962. Carpenter served as the capsule communicator for Glenn’s flight and can be heard saying, “Godspeed, John Glenn” on the launch recording. 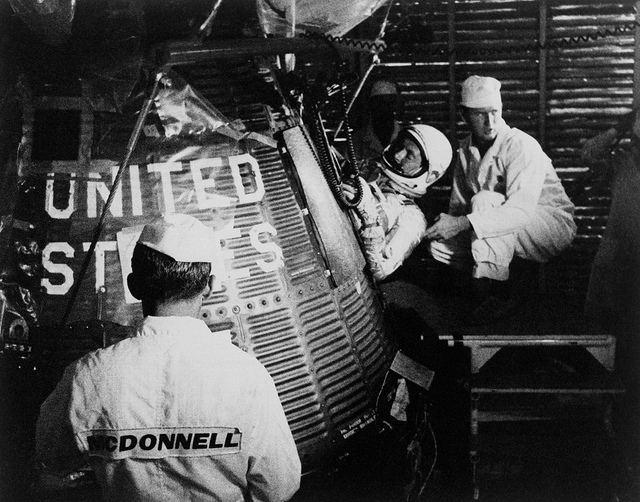 Carpenter’s flight in the Aurora 7 capsule was challenging. Carpenter’s attitude control fuel was excessive and fuel for maneuvering thrusters ran so low that mission control almost ended the flight after two orbits, instead of allowing it to continue for the scheduled three. Carpenter spent 77 minutes drifting to conserve fuel. Due to spacecraft alignment error when the retrorockets were fired, and a three-second delay, the Aurora 7 landed 250 miles beyond the intended landing point. For more than 30 minutes, the capsule was lost and people around the world following the flight on radio and television waited in suspense. Finally, a recovery plane followed a homing beacon to the floating capsule. Carpenter spent nearly three hours on the water before recovery. During a subsequent leave of absence from the space agency, Carpenter participated in the Navy’s Man-in-the-Sea Project as an Aquanaut in the SEALAB II program off the coast of La Jolla, California, in the summer of 1965. During the 45-day experiment, Carpenter spent 30 days living and working on the ocean floor. He was team leader for two of the three 10-man teams of Navy and civilian divers who conducted deep-sea diving activities in a seafloor habitat at a depth of 205 feet. Carpenter is the only American who served as both an Astronaut and an Aquanaut. Carpenter returned to duties with NASA as Executive Assistant to the Director of the Manned Spaceflight Center (now the Lyndon B. Johnson Space Center). Carpenter helped design the Apollo Lunar Landing Module and was active in underwater Extravehicular Activity (EVA) training of astronauts for spacewalks. Carpenter left NASA in 1967 and returned to the Navy’s Deep Submergence Systems Project (DSSP) as Director of Aquanaut Operations during the SEALAB III experiment. He retired from the Navy in 1969 after 25 years of service. Aerospace and the sea remained focuses for the remainder of his life. Carpenter founded Sear Sciences, Inc., a ventured capital corporation aimed at developing programs for enhancing utilization of ocean resources and improving the environmental health of the planet. In pursuit of these and other objectives, Carpenter worked with the French oceanographer J.Y. Cousteau and members of his Calypso team. Carpenter dover in most of the world’s ocean, including under the ice in the Arctic. Carpenter continued to apply his knowledge of aerospace and ocean engineering as a consultant to industry and the private sector. He lectured frequently in the U.S. and abroad on the history and future of the ocean and space technology, the impact of scientific and technological advance on human affairs and man’s continuing search for excellence. He also served on the boards of several corporations. As a consultant to sport and professional diving equipment manufacturers, Carpenter contributed to design improvements in diving instruments, underwater breathing equipment, swimmer propulsion units, small submersibles and other underwater devices. Additional projects brought to fruition by his innovative guidance involved biological pest control and the production of energy from agricultural and industrial waste. He was also instrumental in the design and improvement of several types of waste handling and waste transfer equipment. Carpenter authored two novels, both dubbed “underwater techno-thrillers.” The first was titled The Steel Albatross. The second, a sequel, was called Deep Flight. His memoir, For Spacious Skies, which he co-authored with his daughter Kristen Stoever, was published by Harcourt in January 2003. Carpenter’s awards included the Navy Legion of Merit, the Distinguished Flying Cross, NASA’s Distinguished Service Medal, the University of Colorado Recognition Medal, and the Collier trophy. Carpenter lived in Vail, Colorado for many years and was an avid skier. 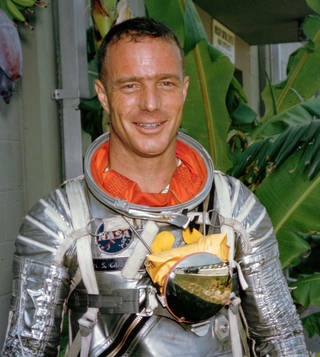 Astronaut Scott Carpenter died on October 10, 2013.